It was Murray's first appearance in a Grand Slam since last year's Wimbledon quarter-finals, nearly a year since he underwent hip surgery. 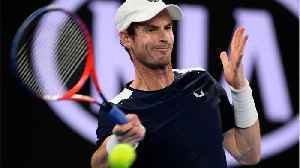 (CNN)Andy Murray has made a tentative return to the court following the hip surgery that he hopes could save his tennis career. A post shared by ITF Tennis (@itf__tennis) on Apr 2, 2019 at 12:47am PDT..